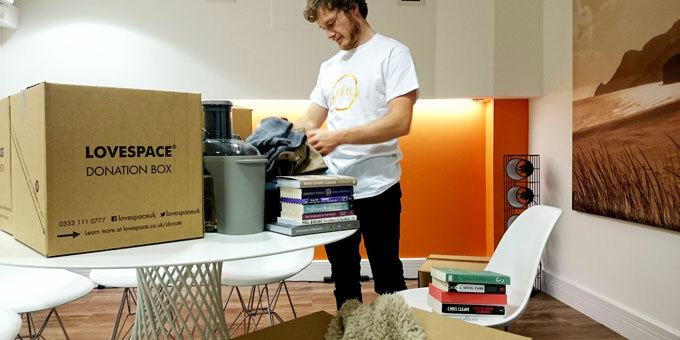 Here at LOVESPACE, giving is a big part of who we are, which is why we’ve partnered with some of the largest charitable organisations in the UK like Oxfam and Depaul to help us do so. We support Oxfam by offering a convenient way to donate unwanted items from the comfort of your own home. Not only do we help you to live a bigger life by offering stress-free storage, you can also effortlessly donate unwanted items to Oxfam at the same time. We can send 1 FREE donation box to you at for every 3 boxes you store with us. Simply fill it up and we will collect and send it to Oxfam. To date, we have donated 1,150 boxes and items, with an estimated value of £21,000 to Oxfam! We source our donation boxes from The Depaul Box Company. This means that when you order a donation box from us, you are also supporting the fight against youth homelessness in the UK. To get started, order some LOVESPACE donation boxes below.